All including dressing ＆ accessories fee. No Preparation OK for all Plans! No additionnal fee; both dressing and accessories are included in the set. Our standard kimono plan is fancy and reasonable with good value. We recommend this plan to those who experience our kimono rental for the first time or want to experience kimono reasonably and easily. Also, the stock of this plan is especially abundant for those who want to choose simple designed kimono or calm-colored one. We also recommend the plan to those who want to enjoy the coordination of colorful obi, accessories and kimono. On our premium kimono plan, there are many famous brand-name kimonos, and they attract those who love fashion. To make customers happier enjoying brand-name kimonos, we apply lowest fair for our service in Kyoto to relieve customer’s concern about pricing. We highly recommend this plan to those who want to enjoy the luxury of decorative modern kimono. Among the brand kimono, it’s a plan that aligns a selection of luxurious kimono. Actually, you will feel the finest comfort cause that it uses a high-quality fabrics. Pattern that determines the personality of the kimono, in addition to the classic of Japanese pattern, also to line up sophisticated modern pattern designer unique. If you like to wear Kimono at least once, why not enjoy the Kyoto city in luxury Kimono? Though there are many kimono rental shops in Kyoto, the one where you can rent Mamechiyo modern kimonos is only at wargo shop. In our Mamechiyo modern kimono plan, you can enjoy the combination of obi and accessories. There are ribbon patterns and abstract painting patterns as well as standard flower patterns, etc. Applied motives are beautifully various and innovative! Feel your heart’s content behind Mamechiyo modern kimono layer! Our ‘Antique Kimono Plan’ is limited a Tokyo Sensoji store. The upscale pure silk kimonos are classified for this plan. There are romantic and bold patterned kimonos and Edo-komon-like patterned kimonos, and you can wear such kimonos for small parties. Such very unique kimonos will absolutely add grace to the Asakusa downtown atmosphere!! Enjoy the walk in Asakusa with your heart’s content. The furisode rental plan inspires you to take the Kyoto walk and feel the absolute femininity. The intersting point of this casual style is the combination of fancy hanhaba obi with cute furisode. You will be again proud of being girl with the special right in not only coming age ceremony but also around Kyoto townscape. This professional rental plan will surely excite your walk in Kyoto City with furisode. It combines fukuro obi, which is used as formal dress, with girly furisode. It is recommended for special parties as well as leisure walk. This plan livens up your special days and strengthens your love for kimono. “When in Rome do as the Romans do”. Kimono is the best fashion for men in winter in Kyoto! We introduce our kimono plan for men. Kyoto town which has many shrines and temples shows different beauty and nostalgia during 4 seasons. For that reason, men and women in kimono look definitely graceful. 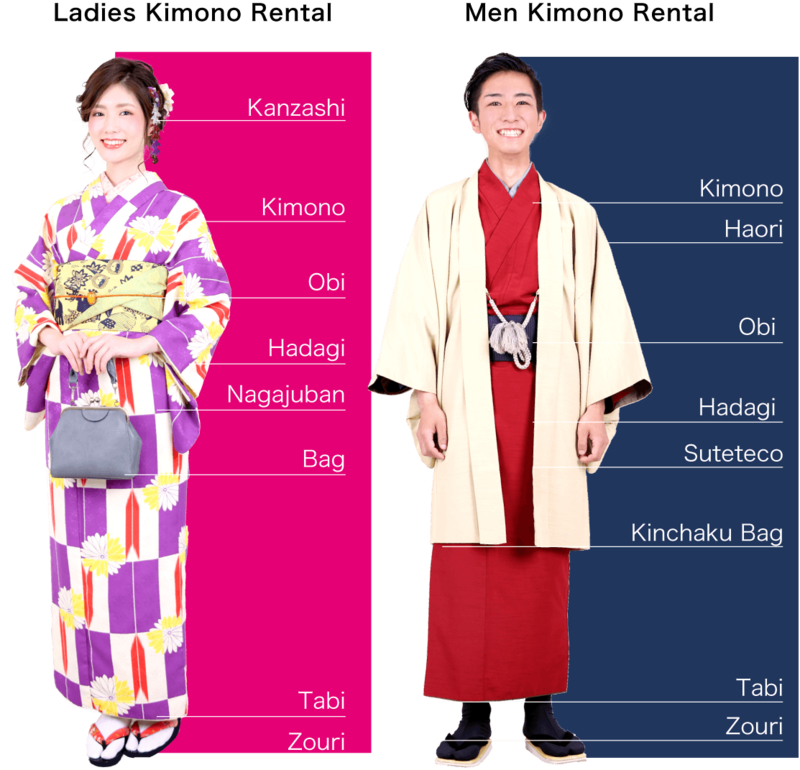 Our kimono plan for men includes Japanese traditional sandal, kinchaku, and haori for cold season! Enjoy true Japan style! This kimono plan is for children from 3 to 10 years old, with height from 90cm to 130cm. Not only adult kimono, kimono rental Wargo provides many stylish kimono with cool and cute design for kids! We welcome little customers to rent with or without parents. Let’s put on kimono on that special occasion! This is the most reasonable plan that consists of the standard kimono plan and the kimono plan for men. This plan is appropriate for making a wonderful memory as a part of your travel or a birthday present and so on. Please make the most of the plan that deepen your relationship. It can be also a surprise gift. This is a luxury plan that consists of the standard Kimono plan and a Kimono plan for men. This plan is a good bargain for couples! Please make the most of the plan as a present for your girlfriend or a surprise gift. Why don’t you experience the extraordinary moment by wearing Kimono? This plan is a set of Mamechiyo Modern Plan and a Kimono plan for men. This can be a great present for your girlfriend such as for her birthday, the anniversary for wedding proposal as well as a part of your travel plan. To men’s customers, please make the most of it as a surprise present to your girlfriend. This will deepen your relationship. Limited to Asakusa store! This plan includes our antique kimono plan and kimono plan for men, which is suitable for couples. Choose this plan for a surprising present to celebrate your love when you have a date to Asakusa, Ueno, and Skytree in kimono.